Big wave of AI & ML coming to healthcare | Potentia Analytics Inc.
Big wave of artificial intelligence and machine learning coming to healthcare. 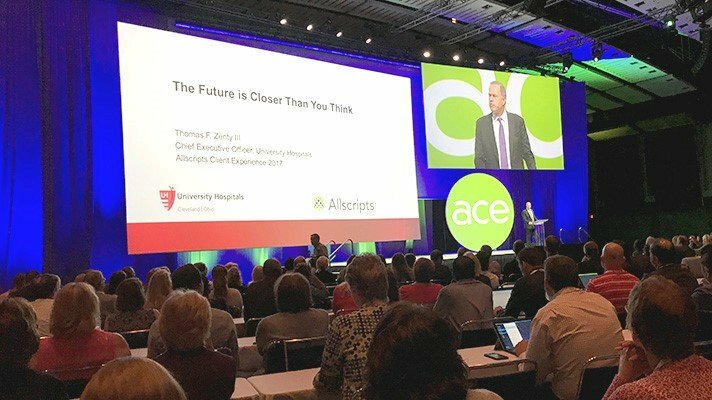 CHICAGO — As hospitals and health systems leverage information technology, healthcare executives must advocate for caregivers to improve provider satisfaction, be prepared for a telehealth explosion, embrace machine learning and artificial intelligence, incorporate the Internet of Things, and prepare for more cyber-attacks, said Thomas Zenty, CEO of University Hospitals of Cleveland. Zenty delivered today’s keynote address at Allscripts Client Experience, the EHR vendor’s user conference here. The wellness of providers, the degree to which they are satisfied with their jobs, is key to operating a hospital or health system. Collection, aggregation and interpretation of data is critically important, Zenty added. But provider wellness cannot be overlooked. “We can’t just assume because we have an EHR it’s going to be automatically adopted,” he said. Telemedicine is an area of health IT that has been around for quite some time, and is starting to see a growth spurt. More providers are embracing the technology and more insurers are paying for telehealth services. Machine learning and artificial intelligence are other technologies that are sparking interest in healthcare. They enable computers to handle greater amounts of work than human beings can undertake and will become increasingly important in the era of consumerization. Zenty added that it’s only a matter of time before voice technologies like Siri and Alexa will play a role in hospitals. The Internet of Things is another area healthcare executives must prepare for. Zenty said in 2015 there were 15 billion installed things on the IoT, and that in the next five years the number of devices on the IoT will grow to 51 billion. And with the IoT comes more cybersecurity issues. The threat level is high already. Imagine what will happen with 51 billion connected devices. https://www.potentiaco.com/wp-content/uploads/2018/02/Big-wave-of-artificial-intelligence-and-machine-learning-coming-to-healthcare..jpg 400 712 Potentia Analytics https://potentiaco.com/wp-content/uploads/2018/01/PA-Logo-Transparent-640x312.png Potentia Analytics2018-02-02 15:52:152019-02-14 12:15:16Big wave of artificial intelligence and machine learning coming to healthcare.